Yesterday the 4th Edition of Air Canada's Earn Your Wings launched and like the 3rd edition, it is strictly for Air Canada Altitude members. The 4th Edition looks to be almost an exact copy of the 3rd edition. The only differences we can spot so far are the 3rd edition only had 62 airports qualifying and it also had Fairmont and Avis components which are absent this time. The premise of this and past Earn Your Wings promotions is to earn Wings by completing various earning actions. In this fourth version you will receive 2,000 Bonus Aeroplan Miles for every 2,000 Wings collected. The more 'Wings' you collect the more Aeroplan miles you earn with a maximum of 750,000 Aeroplan Miles awarded per individual. If you end up in the top 20 Wings earners you will get an equal share of 10,000,000 Aeroplan Miles (500,000) over and above the miles you earn from the promotion. Earn 500 Wings simply for having Air Canada Altitude status upon registration. 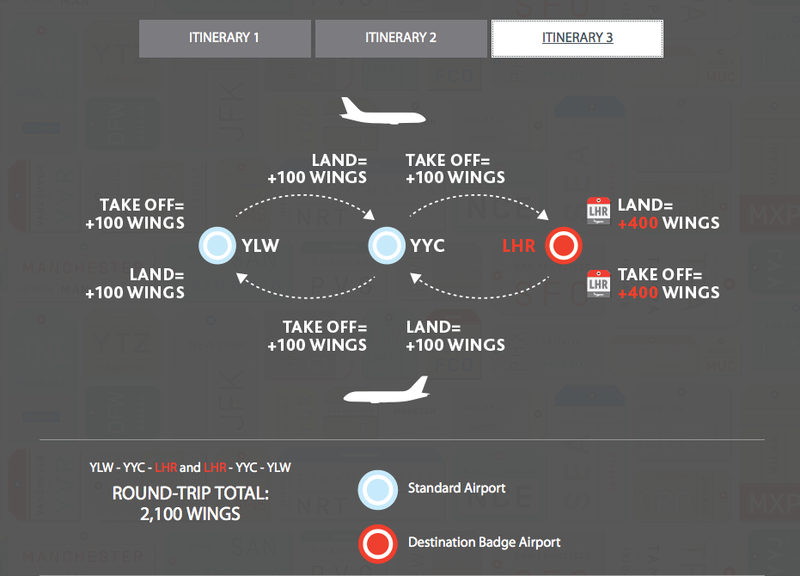 Earn a minimum of 100 Wings for every take off and for every landing on any Air Canada flight (including flights operated by Air Canada Express) and Air Canada rouge. This translates to a minimum of 200 Wings per flight segment. There are 67 airports that will earn a higher amount of Wings for every take off and every landing. Refer to the list of cities that will earn Destination badges. Finish in the Top 20 and earn your equal share of 10,000,000 Bonus Aeroplan Miles. To participate in Earn Your Wings you must be an Air Canada Altitude member and register online at: http://earnyourwings.aircanada.com/ by May 31st. Flights booked between April 20th and May 31st that are completed by July 12th will count towards earning your wings. Awarded when you take off or land in Halifax, Nova Scotia. Awarded when you take off or land in Ottawa, Ontario. Awarded when you take off or land in Sudbury, Ontario. Awarded when you take off or land in Quebec City, Quebec. Awarded when you take off or land in Regina, Saskatchewan. Awarded when you take off or land in Thunder Bay, Ontario. Awarded when you take off or land at Toronto's City Airport, Ontario. Awarded when you take off or land in Saskatoon, Saskatchewan. Awarded when you take off or land in Victoria, British Columbia. Awarded when you take off or land in Boston. Awarded when you take off or land in Washington D.C. – Ronald Reagan National. Awarded when you take off or land in Newark. Awarded when you take off or land in Fort Lauderdale. Awarded when you take off or land in Houston. Awarded when you take off or land in Las Vegas. Awarded when you take off or land in Los Angeles. Awarded when you take off or land in New York City – LaGuardia. Awarded when you take off or land in Orlando. Awarded when you take off or land in Miami. Awarded when you take off or land in Chicago. Awarded when you take off or land in Philadelphia. Awarded when you take off or land in Phoenix. Awarded when you take off or land in San Diego. Awarded when you take off or land in Seattle. Awarded when you take off or land in San Francisco. Awarded when you take off or land in Tampa. Awarded when you take off or land in Honolulu. Awarded when you take off or land in Maui. Awarded when you take off or land in Athens. Awarded when you take off or land in Brussels. Awarded when you take off or land in Copenhagen. Awarded when you take off or land in Edinburgh. Awarded when you take off or land in Rome. Awarded when you take off or land at London Heathrow. Awarded when you take off or land in Lisbon. Awarded when you take off or land in Manchester. Awarded when you take off or land in Milan. Awarded when you take off or land in Nice. Awarded when you take off or land in Venice. Awarded when you take off or land in Zurich. Awarded when you take off or land in Amsterdam. Awarded when you take off or land in Istanbul. Awarded when you take off or land in Tel Aviv. Awarded when you take off or land at Tokyo–Haneda. Awarded when you take off or land in Seoul. Awarded when you take off or land at Tokyo–Narita. Awarded when you take off or land in Osaka. Awarded when you take off or land in Buenos Aires, Argentina. Awarded when you take off or land in São Paulo, Brazil. Awarded when you take off or land in Lima, Peru. Awarded when you take off or land in Mexico City, Mexico. Awarded when you take off or land in Santiago, Chile. Awarded when you take off or land in Panama City, Panama. Awarded when you take off or land in Rio de Janeiro, Brazil. Earn 500 Wings simply for registering and having Air Canada Altitude status. You must register between April 20 and May 31, 2015 by 19:59 Eastern Time, inclusively to earn this badge. Congratulations on making it to the top! Earn your share of 10,000,000 Bonus Aeroplan Miles miles for landing in the final Top 20 of the leaderboard as of September 18, 2015. This badge will be awarded on September 18, 2015. Pick which side of the Channel you like best – or try both! Earn this badge every time you take off or land at any 2 of the 3 following airports: London Heathrow (LHR), Brussels (BRU), Paris (CDG). Feel like royalty every time you take off or land at any 2 of the 4 following airports: Paris (CDG), Milan (MXP), Madrid (MAD), Venice (VCE). The dynasty is gone but the splendour remains! Earn this badge every time you take off or land at any 2 of the 4 following airports: Hong Kong (HKG), Beijing (PEK), Shanghai (PVG), Osaka (KIX). From East to West, take the scenic route! Earn this badge every time you take off or land at any 2 of the 4 following airports to earn this badge: Victoria (YYJ), Winnipeg (YWG), Halifax (YHZ), Quebec City (YQB). A toast to you! Indulge in the sand and sun and earn this badge every time you take off or land at any 2 of the 5 following airports: Mexico City (MEX), Rio de Janeiro (GIG), São Paulo (GRU), Buenos Aires (EZE), Panama City (PTY). Experience the regalia every time you take off or land at any 2 of the 4 following airports: London Heathrow (LHR), Manchester (MAN), Dublin (DUB), Edinburgh (EDI). Visit these unique urban waterways and earn this badge every time you take off or land at any 2 of the 5 following airports: Amsterdam (AMS), Manchester (MAN), Paris (CDG), Venice (VCE), Copenhagen (CPH). Explore the great Pacific coastline and earn this badge every time you take off or land at any 2 of the following 5 Pacific Coast airports: Sydney (SYD), Tokyo–Narita (NRT), Tokyo–Haneda (HND), Incheon (ICN), Osaka (KIX). Satisfy your sweet tooth after earning this badge every time you take off or land at any 2 of the following 5 South American airports: São Paulo (GRU), Bogotá (BOG), Lima (LIM), Santiago (SCL), Buenos Aires (EZE). From plentiful plains to the ‘Breadbasket,’ earn this badge every time you take off or land at any 3 of the following 4 airports: Edmonton (YEG), Saskatoon (YXE), Regina (YQR), Winnipeg (YWG). Travelling through the province of this emblematic flora? Earn this badge every time you take off or land at all 3 of these Ontario airports: Ottawa (YOW), Thunder Bay (YQT) and Toronto's City Airport (YTZ). Earn this badge every time you take off or land at any 3 of the following 5 airports, located in cities famous for their local brew: Brussels (BRU), Frankfurt (FRA), Munich (MUC), Geneva (GVA), Zurich (ZRH). Experience the zest of travel and earn this badge every time you take off or land at any 2 of the following 4 Sunshine State city airports: Miami (MIA), Fort Lauderdale (FLL), Orlando (MCO), Tampa (TPA). Slap on your sunscreen and earn this badge every time you take off or land at any 3 of these 6 sun-soaked airports: Houston (IAH), Las Vegas (LAS), Los Angeles (LAX), San Francisco (SFO), San Diego (SAN), Phoenix (PHX). Return to where it all began, and earn this badge every time you take off or land at any 2 of the following 5 ancient cities: Rome (FCO), Venice (VCE), Athens (ATH), Tel Aviv (TLV), and Istanbul (IST). From Chiba to Kansai, travel the Pacific coastline and earn this badge every time you take off or land at any 2 of the following 3 Japanese metropolitan airports: Tokyo–Narita (NRT), Tokyo–Haneda (HND), and Osaka (KIX). I collect Aeroplan miles. How do I know if I'm an Altitude member too?